We left Sanibel and headed the short distance across beautiful San Carlos Bay (Sanibel bridge to our port and the open Gulf to our starboard) toward the Fort Myers Yacht Basin marking the beginning of the Caloosahatchee River heading east across Florida via the Okeechobee Waterway and to the Atlantic. While in Fort Myers we took a restful couple of days including an early morning walk over the Edison bridge accompanied by several dozen Fort Myers police academy recruits in training – not walking. They couldn’t have been more pleasant to us, even when Sammy wandered onto their half of the bridge walkway. We then went onto First Street for breakfast at the United Ale House passing by the FM Police Chief being interviewed on TV which felt like we were on the set of Blue Bloods! Next stop was the Farmers Market along the waterway where we purchased plums, peaches, oranges (of course) and strawberries. Some of the best ever! We also did piles of laundry and endless boat shopping. The Edison Bridge we shared with the police recruits. Note the bridge bumpers extending to the right of the bridge into the water. This is the passageway for boats to follow. Right, we really are going to fit? We now have three boat travel days left between FM and Indiantown (our Florida home port) and probably some of the most stressful of the season. The water levels are the lowest in recent years (skinny water) as there is a drought in SW Florida – some describing it as a tinderbox! Jim called the Army Corp. of Engineers for their take on the situation and learned that the very shallowest point on the waterway is 5.85’ and we need 5’ therefore we hope to have at least .85’ under the keel while in the channel! This does not include shifting and shoaling of sand so not much margin for error. Captain says no-problemo, I say drama and adventure! Leaving Fort Myers early, so as to enjoy as much cool air as possible, we had the channel all to ourselves but the sun rose in our eyes heading east for “April First’s” dock near Labelle Florida. It was a lovely and uneventful morning raising six bridges, easily passing through the Franklin lock and getting happily secured in the Ortona lock, the last before reaching our destination. At just the moment we took a deep sigh of relief, we noticed another sailboat proceeding at a pretty good clip approaching the lock from behind and needing to secure in front of us against the wall. Looks like trouble to me! They waved as they bumped their bow sprint into the cement wall, tried to grab lines, and scraped their starboard side heralded by a terrible screeching sound – perhaps the worst lock entrance we have seen yet. They finally got a hold of bow and stern lines but because they were so far forward in the lock where the water enters, they experienced considerable current and turbulence. Because we were lifting, they could have secured the lines to a cleat but chose not to observe good physics and instead were required to use brute strength to keep their boat in place. Through nonverbal communication we were highly concerned that if they let go, they would instantly be drifting into the Namaste’s bow. It was not a pretty picture but all’s well that ends well and everyone exited the lock reasonably unscathed and we completed our day. The evening, tied to the dock behind April and Dean’s house (see previous post) next to River Forest, could not have been more lovely. In fresh water now we saw a 12’ alligator swimming the channel in mid-afternoon right behind the Namaste. My second real sighting. We napped, had dinner, went for a long walk in their neighborhood and slept for 9 solid hours. This morning we bid these wonderful people farewell, learning that it was Dean’s birthday so they are enjoying a pound of Biggby coffee. Side note: both were born and raised in Cheboygan Michigan and raised three children in a geodesic dome there. April and Dean on their deck as we say good-bye for now. The space was tight but Captain Jim got turned around and we were easily on our way. Somewhere after passing under the highway bridge, railroad swing bridge (we heard the train whistle in the distance), and the Moore Haven lock (easy), I was at the helm, following the magenta line on the chart plotter. I glanced at the depth gauge for a reading and saw 4.2’ Not enough!! Yes, that fast we were aground and quite stuck in the mud! Thankfully it was a calm part of the river but with enough traffic that we knew we wouldn’t be stranded forever. 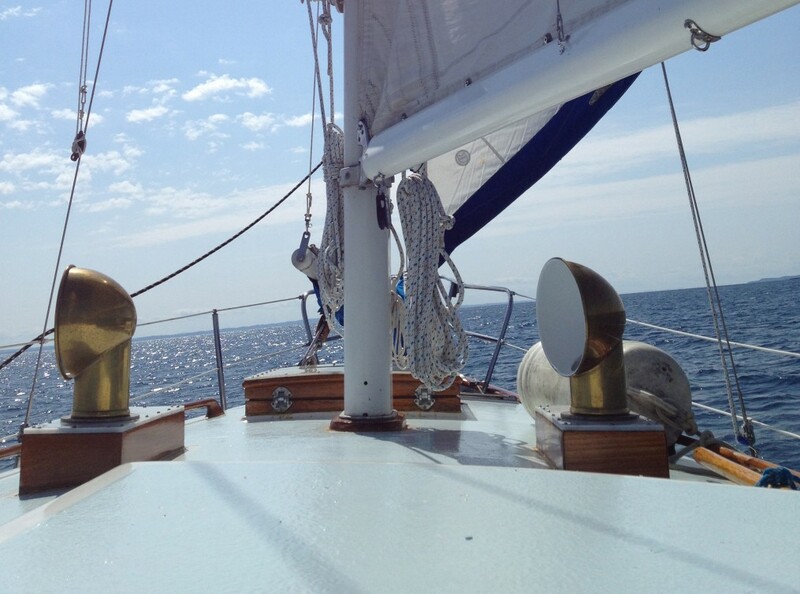 Captain Jim tried reverse while moving the bow back and forth with the bow-thruster. Nope! Next he used the boat hook in an attempt to push us backward off the bottom while I manned the helm in reverse. Nope! Finally, our trusty dinghy and her 6 hp engine pulled us right off and back to free water. We had been too far right in the channel. Who knew?? There were great photo ops along the way today balancing out the grounding episode. If you look closely in the center you will see two birds. A large Egret and a smaller Green Heron standing together on watch. Three separate alligator sightings today! Getting much better at spotting them and now I am at 5! Jim has many more. On to Clewiston was a tense but uneventful trip. Sammy is tied and Jim is sound asleep in his cockpit hammock. The dock master warned us that an alligator was spying Sammy! Sammy Sayz: They don’t think I know that our sailing season is quickly coming to an end but I understand every word they say. I will be happy to come home and see everyone but. . .
. . .I’m gonna miss the wind in my face and living outside!